If you asked a hundred Indians what their favorite comfort food is, I would guess that 95+ would say "Khichdi". I certainly would! This soothing combination of rice and lentils is the food that lights up my memories. When I was growing up, it was the dinner served before starting on a journey. It was the dinner of monsoon nights, when sheets of rain would batter us. It was the thursday night dinner in my college dorm when everyone would eat khichdi and kadhi and pretend they were in the comfort of home. When there was a death in the family, neighbors brought in pots of khichdi to comfort and console. The nourishing, healing, comforting powers of khichdi are universally accepted. Khichdi is the first solid that babies are introduced to. In a world far removed from Gerber's baby food, rice and lentils are simmered till mushy, seasoned with turmeric and salt and fed to infants to introduce them to "people food". Khichdi is the only food people eat when they are sick. The warmth and aroma of just-cooked khichdi perks up palates which are dulled by illness; maybe we should dub it "Indian Penicillin". Khichdi is a meal that is simmered in a single pot. It is the ideal food for campfires and soup kitchens. Khichdi is the food of the poor, a meal that is accessible even with the food budget stretched to its limits. Khichdi is the food of the rich, a showcase for the choicest vegetables simmered with a plethora of lentils and studded with nuts. The word khichdi literally means hodgepodge or mishmash. Hodgepodge or not, khichdi makes for a complete one-pot meal. The rice provides the carbohydrates, the lentils provide the protein, the vegetables add the vitamins and minerals and fiber. A dollop of ghee (clarified butter) provides the right amount of fat and calories, which are as important in a diet as any other food group. All over India, there are as many recipes for khichdi as there as households. It can be spicy or plain, made with a single lentil or combinations of 2-5 lentils. 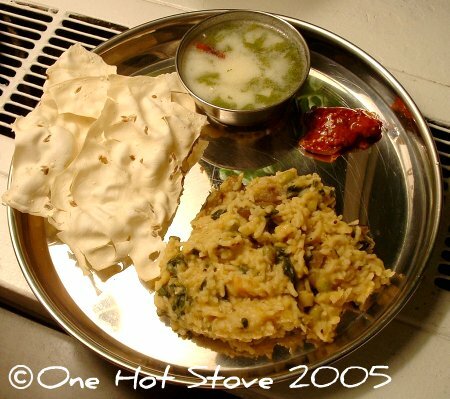 Special khichdis are often made to celebrate special festival days. Traditionally, khichdi is served with a yogurt curry called kadhi. Khichdi-kadhi is the food of the masses, and the food of the gods. In keeping with the philosophy of khichdi-making, I will provide a method rather than a recipe. To make khichdi, heat oil/ butter/ghee in a pot, fry 1 tsp. of cumin seeds and some minced onion for a couple of minutes. Season with salt and turmeric and a dash of garam masala. Add a few cups of mixed diced vegetables (any combination of potatoes, eggplant, peas, carrots, cauliflower, green beans, spinach, tomatoes is generally used). Add a cup of rice and half a cup of lentils (I generally use a combination of red and yellow split lentils). Add 3-4 cups of water and simmer the whole thing till done. It should be mushy and comforting. Garnish with minced cilantro and generous dollops of ghee. Mix 1 cup plain yogurt, 1.5 cups water, 3 tsp. besan ( chickpea flour), 1 tsp. sugar and a dash of salt in a bowl, whisk together and set aside. Now heat oil in a saucepan and "temper" it will 5-6 curry leaves, 1 tsp. minced ginger, 3 dried red chillies and 1 tsp. each of mustard and cumin seeds. Once the tempering is sizzling, add the yogurt mixture and bring to boil. Simmer it for 10-12 minutes stirring almost constantly or until the chickpea flour is cooked. I served the khichdi and kadhi with roasted papads and pickled vegetables, on a traditional Indian steel thali. This is the stuff food memories are made of. I just discovered your blog. I am looking forward to seeing it develop. Being English, I naturally LOVE indian food and I like to cook it sometimes, but am not very experienced. So I am hoping to learn more tips like khicdi-kadhi in the future. aaah you're making me miss home! even though i can make kichdi and kadhi now, somehow it never tastes as good as my moms! Well ive been bugging all my friends for their khitchdi recipes. How abt starting a blog on just khitchi where ppl can contribute their recipes. what a mouth watering blog ! The main ingredients of khichdis made by moms is a dollop of love. There are some things money can't buy, right? A just-khichdi blog...hmmm! Till we get around to doing that, your friends are totally welcome to mail me their recipes and pics and I will be happy to host those here. This is a great post, Nupur. You make me want to go right to the kitchen and cook up a batch of Khichdi-Kadhi. I particularly love the way you share Khichdi as a food philosophy. You know, I wasn't very familiar with indian food until a few weeks ago when I took the plunge and had dinner at an indian-fusion restaurant. Reading this post, and coming across a lot of indian food posts lately only confirms my intention to further explore this cuisine. Loved reading your post and hope to see more! I scanned 15 receipes before i saw your receipe. Easy to cook am sure it tastes good! Hi Nupur - I was just introduced to this combination and I LOVE IT! even at my own very non-Indian hand they tasted fantastic. Here are my versions of Khichri and Kadhi. can u mail me the complete recipe?? please? where can i email u? u can message me here.. I Googled khichidi and your lovely blog showed up.very well written. Thanks.. it made me want to make khichidi immediately!! btw, I'm in St.Louis Mo myself. I loved the recipe!! In fact we are cooking the same this evening at Chennai, India. I recommend boiled eggs to go with the Kichidi. You are absolutely right. Khichdi is the ultimate comfort food for most Indians. My mom would always make khichdi for me when I was sick, and there was nothing more comforting or soothing that a warm bowl of plain and simple khichdi with dahi :) Now, I'm a mom and my baby is sick. Naturally, I googled khichdi to get a recipe. Thanks for the wonderful information. This is "Meat-free" Mike of Urbana, IL to say good luck with your blog! I was searching for khichdi recipes and was lead here. I have cauliflour, I have moong dal, I have potatoes, I have lentils and spices - what a great way to make all of these simultaneously into one big pot of tasty nutrition! I'll visit back from time to time - I love vegetarian Indian cooking! oh my goodness, khichdi is my FAVE indian comfort food! you totally hit the nail on the head in describing it. my mom made it differently, and so i make it differently too, so i thought i would share. first, in 2 tsps of oil, i fry about 1 tsp black mustard seeds until they start to pop, then add about 3/4 tsp cumin seeds, a few curry leaves, and one dried red chili pod (broken into pieces) and fry them until the cumin seeds are pink. (all of this should be over gentle heat since they can go from roasted to burned quite quickly.) then i add 1 cup rice (i use brown rice, just found some great brown jasmine rice at trader joe's that's great) and 3/4 cup masoor dal (split red lentils), 4 cups water, and about 1 tsp asafoetida, and cook it on a low simmer till nice and mushy. i eat it with a nice pat of butter added on top, a generous sprinkling of salt and a squeeze of fresh lemon if i have it. I would like to have the exact recipe please, since my daughter is suffering with her braces, and will go periods of 4 to five days with nearly no food. I know that she will love this recipe, and will gladly have the entire family share it. Beautifully written! Googled, found and read it while I was having my khichdi and needed to describe the concept to someone non-Indian. This is excatly what khichdi is all about. Was looking for a recipe for khicadi and found on your blog thanks a lot . I am also a blogger and soon working on a blog on health related issue would forward you a link if interested . Just tried your Kichidi and Kadhi recipes; they have come out perfect and my husband likes them a lot! More importantly my very picky 5 year old also approves of the taste of the kichidi! Cannot tell you how happy that makes me! Thank you so much for your wonderful blog and your awesome recipes! How do I make a simple mushy khichdi without much spice and sweet kadhi? I had that kind of khichdi in a Rajasthani hotel and I loved it. I can only make spicy khichdi. The one I had there had rice,dal,haldi and I guess jeera. Kadhi was sweet and it had special tangy taste because of small green chili and other masalas. Please tell me how to prepare it. I don't like outside food on weekends. This was an awesome rendition. I usually make my khichdi with just some tomatoes, sometimes I'd throw in some kind of green leafy veggie...but I never thought to put in eggplant! What a great idea! And the garam masala! Thank you! My fiancee usually really disliked my Khichdi and I was the one to eat it alone...now I have to share. I am not so sure I should thank you for that ;) Just kidding! I just found this recipe and it is delicious! I have been craving this dish for almost a year...my mom always makes it but since I don't live at home anymore, I had no idea how to do it on my own. I had to improvise a bit, but it turned out so well. Thank you! What is the white stuff looking like some type of very flat bread? I'm so ready to dive in and explore all that Indian food has to offer along with life wisdom, something we should all embrace. How does one in the states make ghee? I always cook Khichdi as my husband loves it. I also make kadhi regularly but never both together. Today I will try it. Hello! Thanks for posting this, I look forward to making it. Do you know if kadhi can be frozen, if I wanted to prepare a lot of it (like we do for some batches of baby food) and then freeze some to use at a later date? I love how easy this recipe was to make. I used closer to 6 cups of water, and more salt than I would normally consume, but it was a nice treat. Thanks for sharing! Thanks for the sweet note, Nisha. I am so glad you were able to make yourself a delicious meal, and I hope you feel better soon. I don't have a recipe for sabudana vada. I just eyeball quantities, mixing mashed potato with peanut powder, soaked sabudana, jeera, minced chillies, salt, sugar, cilantro and deep frying the balls. Or patting down and shallow frying. I like the way you've introduced this recipe. I don't like khichdi but khadhi I like so much that I can drink it like it were a soup. Tried this today. And just like everything else in your blog it was very delicious. This is going to be a regular on the rotation now.